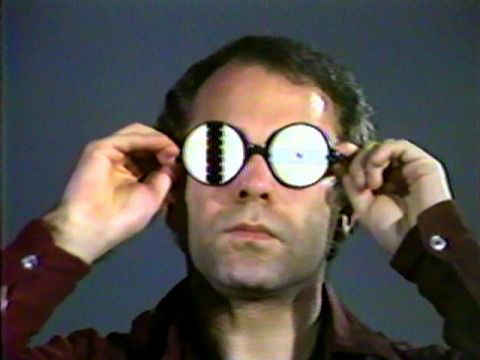 David Rimmer is one of the most renown Canadian experimental filmmakers. Because of the variety of techniques, genres and subject matter, Rimmer’s films and videos defy the usual critical and scholarly efforts to label and generalise about the artist’s work as a whole. Much of his film work of the 1970s falls within the parameters of the structural and structural-materialist films that dominated experimental filmmaking during that decade. Rimmer was also making film loops for performance pieces. This probably led to his most widely seen film, "Variations on a Cellophane Wrapper" (1970), made from a short segment of an NFB documentary. "This is a film about feminism and it’s about women stuck in a factory", says Rimmer. The basic image is a female factory worker unrolling a large sheet of cellophane, then he starts his variations in contrast, dimensionality, inversion, colour and frequence. Stuart A. Sherman (1945-2001) was a performance artist, playwright, filmmaker, videographer, poet and much more. He was possibly best known for his solo "spectacles": programs of very short playlets performed on portable tabletops propped open on the sidewalk - or in the park, or someone’s apartment - in which he would physically manipulate and create semantic "dramas" around inanimate objects. He created and performed eighteen "spectacles" in all as well as larger-scale dramatic works, films and videos (rarely lasting more than five minutes and many were portraits of friends). Sherman’s "Twelfth Spectacle (Language)" from 1980 plays with the syntax of common objects, using familiar items such as telephones, balloons and magnets to stage rhetorical questions.